Holme Park Krug is the result of a very concentrated and planned breeding program. His dam Holme Park Kremona was brought into the Holme Park herd specifically as a breeding partner to Holme Grove Solomon. She is by premium and Champion Stallion EH Kostolany, who competes at Prix St George and has three half-brothers all with the same sire premium and Champion stallionEnrico Caruso (advanced dressage horse now in USA) they are, Bolschoi-D (Advanced dressage), Thimur (Intermediere I). Kostolany is the sire of 7 approved stallions: Bertone, Sans Souci, Showmaster (now winning Intermediere I under Christian Pläge), Silvermoon, Gribaldi (Champion and premium stallion), Tolstoi (Premium stallion) and Zaubertanz. 7 State Premium Mares: Kandra, Samira, Shadee, Herzlani, Hellena II and Korlany. Kremona’s dam is by the legendary sire Tenor Reserve Champion Stallion in 1980. HP Solomon already had a son graded as a stallion in 1994, Holme Park Vincent was approved by the Canadian Trakehner Horse Society with the second highest grading marks ever awarded at a grading in Canada. 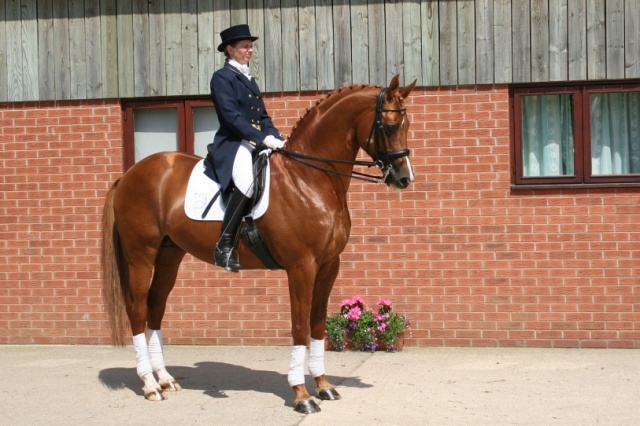 In 1998 HG Solomon achieved a great accolade and was crowned ” BHF Top British-Bred Dressage Sire 1998.” He had at that time 14 offspring competing to date the eldest of which was 8 years old and their British Dressage points total 788. In 1999 he was runner up by one point to Dutch Gold and again in 2000 he was the Top British Bred Dressage sire on progeny performance. 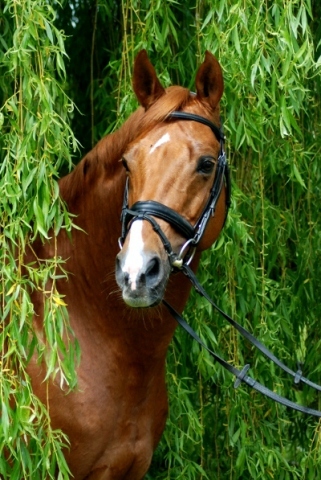 HG Solomon is extremely closely related to the 1976 Champion Stallion in Neumunster Schiwago. They are both from the same dam Holme Grove Schlobitten and the difference in sires is that HG Solomon’s sire Fernando is grandson to Schiwago’s sire Tannenberg. Graded by the TBF in Sept 1998. HP Krug was the first stallion to be approval by the TBF for five years. He is also the very first stallion graded in this country that is second generation British Bred. 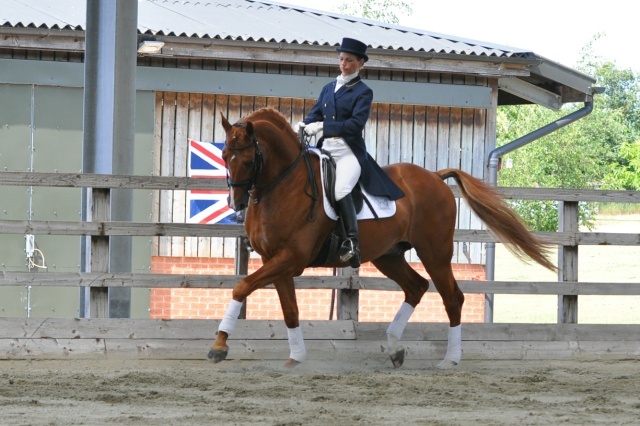 HP Krug successfully passed his 100 day Performance Test in Neustadt Dosse, Germany in October 1999, scoring 9’s for temperament, rideability and trainability. He made an excellent start to his competition career in 2002 winning every time out and qualifying for Hickstead on 2 occasions for the Shearwater National and International 6 year old Championships. He was 8th in the final Championship Line up at the National Shearwater Championships in very good company. Julia Wetton (my sister) took over the ride at the end of 2002 and has been schooling him until she had time out to have her baby in 2004. Krug was due to go into training with Peter Storr but unfortunately injured himself in the lorry on the journey to Peter’s and was then off work for the next 12 months. He is now being ridden and trained at home by Debbie Watts currently working Advanced Medium Level. Krug was awarded UK Elite Status by Trakehners UK in 2013 due to his outstanding breeding record and progeny achievements. HP Krug’s first crop of foals were born in 2000. 2000 HP Sienna , HG Devaux and HP Kur and achieved 1st & 3rd in the TBF Foal class and Champion foal 2000. HP Dynamo was born in 2001 and won 1st in Part Bred TBF Foal class and Supreme Champion PB Trakehner at the 2001 Annual Show. 2002 brought another crop of outstanding foals including the TBF Champion foal and Reserve Supreme 2002 Holme Park Vanity who was also Best British Bred Trakehner 2002 .The black yearling filly Holme Park Kaskade became Reserve Champion Youngstock 2002. 2006 HP Kur completed her Mare Performance Test with 7.3 Reserve Champion and awarded Premium. Holme Grove Devaux Premium graded and Performance Test, Holme Park Kadence, Holme Park Kaskade and Holme Park Diva all awarded Premium (subject to Performance Test.) Holme Park Kaskade –Champion Riding Horse. Holme Park Diva Reserve Champion of the Mare Grading and Rsv Champion Mare of Show. 2012 HP Devinci TBF Loose Jumping Champion and Riding Horse Champion. HP Lionni confirms her premium Status with 7.6 in Mare Performance Test.